Sarah Silverman I Used to Say 'That's So Gay' I'm Done w/ That!!! Sarah Silverman understands times have changed ... and that's why she's no longer the same person or comedian who used to bank on homophobic jokes. We got Sarah outside of Craig's Thursday night and wanted her take on Nick Cannon dragging her name in the Kevin Hart controversy. ICYMI ... Nick was furious about the backlash Kevin got after old homophobic tweets resulted in him stepping down from his dream gig as host of the Oscars. 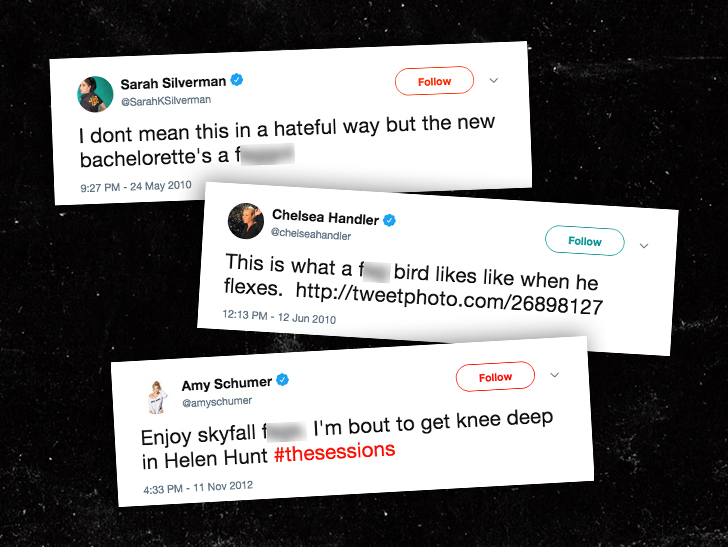 So, Nick dug up some old tweets by Sarah, Chelsea Handler and Amy Schumer in which they used similar language. Point blank ... Nick thinks there's a serious double standard in Hollywood. Sarah's planning to address Nick's comments on her own platform, but she did say she sees things differently than she did back in the day. But, Sarah made a solid point ... people shouldn't try to bully comics.